SANTA CLARA, Calif., April 4, 2018 – CloudPhysics Inc., a global leader in Hybrid IT Physical and Virtual Infrastructure management solutions, and Sureline Systems, leader in enterprise-class on-premises and cloud, physical and virtual server Migration and Disaster Recovery solutions, are announcing a strategic partnership to deliver a cost-effective, seamless and fully automated Cloud Migration experience. Modern IT organizations with virtualized workloads in their data centers can now analyze and migrate workloads on-premises, to or from any cloud, at the push of a button. 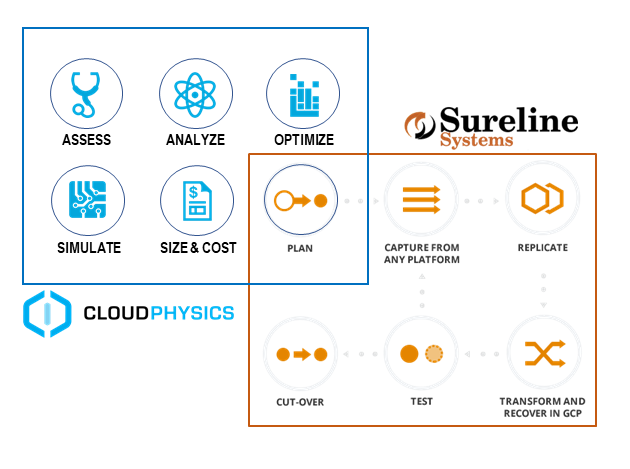 The product integration between CloudPhysics and Sureline Systems enables IT administrators to analyze, optimize, simulate, size and cost workloads and load eligible workloads for migration by Sureline Systems, for lift and shift to their new destination. Analytical reporting, dashboards and performance benchmarking are available every step along the way. CloudPhysics is one of the market’s fastest growing channel intelligence platforms, designed to enable data-driven collaborations. Our platform ensures customers succeed in their adoption of products and services for next generation IT infrastructure. Combining an agile SaaS platform with a global partner network, CloudPhysics helps customers leverage expert resources to plan and execute public, private, and hybrid cloud migration through analytical assessments and simulations. Headquartered in Santa Clara, CA, CloudPhysics serves thousands of users worldwide across major industries and supports a growing partner network. Sureline’s patented, award winning SUREedge® is a proven enterprise-class software solution for Cloud Migration, Cloud Disaster Recovery, Datacenter Consolidation and Application Mobility. SUREedge reduces risk through encrypted and efficient data transmission, and reliable transformation of the entire application, its data and interdependencies from source server to the target server virtualization or Cloud. It is easy-to- deploy and manage through a single UI, with automated discovery, no agents to install, and is completely non-disruptive. SUREedge is source and destination agnostic working to/from any physical server, any hypervisor (including hyperconverged infrastructures), any cloud, and any storage. Customers worldwide trust SUREedge to meet their workload migration, disaster recovery and application mobility objectives. Sureline is headquartered in San Jose, CA., and its products and services are available through a global network of VARs and technology service providers.